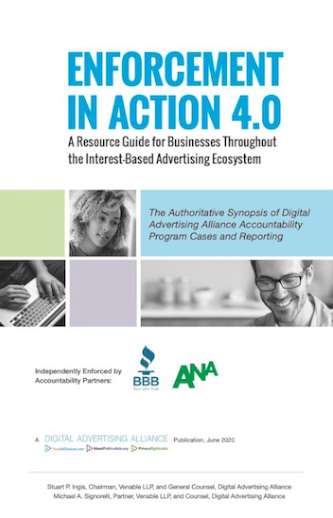 The Council of Better Business Bureaus (CBBB) and its Advertising Self-Regulatory Council, and DMA [Data & Marketing Association] have agreed to work cooperatively to ensure accountability and enforcement of the DAA Principles. Together, the CBBB and DMA are responsible for monitoring and enforcing compliance, as well as managing consumer complaint resolution. Both programs police entities engaged in online behavioral advertising and help bring these entities into compliance. If you believe that you have witnessed a practice or ad that may violate the Principles, you can report the incident to either the CBBB or the DMA. Complaints may be filed by either consumers, business entities, or other stakeholders. Both the CBBB and DMA coordinate investigation of all complaints received and report on cases and complaints related to the DAA Principles, permissible data collection under the DAA Principles, and interest-based advertising.